Uh oh! Emily and Josh are still snowed in. What's more, HAJU is in a particularly bombastic mood and provides all of the musical recommendations. In lieu of reading your testimonials, J&E discuss the future of educational gaming, what games Emily beat, and the future of the podcast. 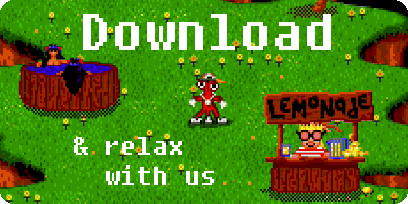 Don't worry, the snow will soon melt and all will be made as clear as stunning 16-bit graphics, so come on in! If holiday specials have taught us anything, it's that when you get snowed in, surprise guests are bound to appear. So join Josh and Emily back in the Dungeon as they're visited by some very special friends for discussions on faux-nostalgia, hair-gel, dinosaurs as transportation, the quest to recover forgotten games, the banana part of the squib, the alternate dimension represented by TurboGrafx-16, and MUCH MUCH MORE. Starring Josh and Emily, Mike and Ed from PixelTunes Radio, and Bryan and James from Pixelated Audio. Happy Holidays! Josh and Emily burn the midnight oil to make sure this episode gets to you in time. Along the way they forget to address a patron’s question (sorry Carlos), play an incorrect track (sorry Poliester Ties), and talk more about Pokémon Go (sorry everybody). But on the positive side, everyone makes it to the jukebox safe and sound for the usual round of excellent jams. Did you know that John Lennon recorded "Revolution" laying on his back? Well, in the great tradition of The Beatles, Emily records this episode from her office floor. Can you tell that she's under the weather? Let us know in the comments. Join sick Emily as Josh takes the captain's chair in discussions about transporter technology, the healing power of sushi, dating Emily's mom, and much more. 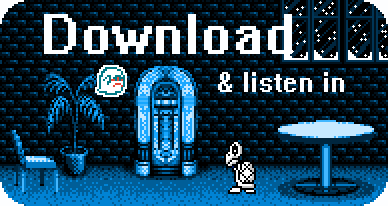 This episode features VGM Jukebox fanfic and whether you like it or not, Pokemon Go! strategies. Whether you are soaking in a sore defeat, or just taking a victory jacuzzi, Josh and Emily decided it would be a good time to fulfill a request made long ago, which is a music-only mix of our very popular Spa Zone Act 1 episode. Full disclosure: This episode was recorded on Election Day, so Josh was not sure whose crown he would soon be polishing (it's his job). But despite their enthusiasm about the democratic process, Josh and Emily imagine an entirely new political system -- one in which we replace our current economy with the construction of a single giant robot. Don't worry though, dear patron, its design will be realistic and practical. Stick around for Shiny Pokémon talk, as Emily reveals the depths of her mysterious commitment to palette-swapped 'mon. And stay strapped-in for the long-awaited return of the Carrot Man. It should go without saying, but of course this will all be served on a bed of piping hot jams. 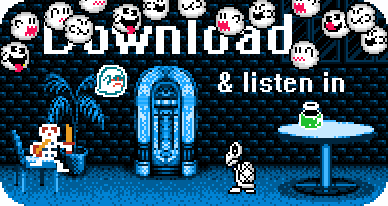 Yeah, you got it, it's the VGM Jukebox! This week Emily starts out with some negative status effects, but Josh and the patrons mix up the cure in the form of disgusting healing items and fantastic jams, respectively. 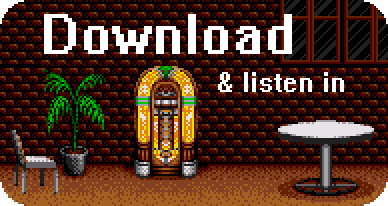 Listen in while they explore pipe dreams of Cadillacs riding dinosaurs, VGM composers commandeering pop concerts, and a world where Shy Boo and Cookie get along. Josh also opens a mystery package on this episode, which among other things includes a very, very important inventory item. Who ever said necromancers weren’t considerate? Guess what, patrons? It's almost Halloween, and Emily has decided to embrace her necromancer identity by reviving some seriously old recommendations... for a dance party! Get your spook on in the dungeon with Key, Cookie, HAJU, the Assorted Boos, and of course Josh, who's chaperoning. So slap on some eyeliner, get close to the stage (or emergency exit), and let's party it up tonight! This week we enter a safe space as Josh continues to explore his Japanese half, Emily admits her weirdest video game character crush, and both hosts solve the mystery of Link's continual incarnation in each Legend of Zelda game. Also, the Halloween VGM Music Box Contest is nigh! Emily plays a clip of a VGM music box arrangement and it's up to YOU to figure out which Halloweeny game it's from. The first patron to call it on any VGMJB social media channel wins -- so get listening, and start guessing! Hop into a hot rod for a race to the edge of the world map as Josh and Emily tune in to some fantastic VGM recommendations from patrons new and old. Roadtrip conversations include theories of the apocalypse, revising the definition of Anime, and Emily's plans to visit Josh's grave. Then, stay tuned for a mysterious patron-submitted present that will blow your socks off. This is the episode that will give you that "driveway moment." You won't to want to miss it! There’s a whole lot of channelin’ goin’ on in today’s episode as the hosts call upon the spirits of Bogus Meat Factory, Brent Weinbach, Goku, and countless undead NPCs. Is KeyGlyph a necromancer, or does she prefer the company of robots? Is Josh an enemy boss, or just some guy who likes throwing books and drinking whiskey? And if VGMJB were a video game, what would be the good ending? Tune in and evaluate the evidence... which may leave you with more questions than answers. This week’s episode is all about adventure. While the tunes capture that end-of-summer feeling, Josh churns out more ideas for VGMJB corporate ventures, Emily’s heart nearly explodes from the sheer awesomeness of the setlist, and the intriguing possibility of a multi-podcast crossover emerges. If you're excited about a hypothetical episode of The Pixelated Radio Jukebox, let us know! Who knows what the future may hold...?